Summary: Enjoy today. Rain chances come back in the forecast every day after today. Friday and Saturday are the best chances for rain. Today is going to be another great day and a repeat of yesterday, as our high temp reaches 76 degrees under sunny skies. Tonight, temps will drop to 53 degrees with some clouds in the sky. 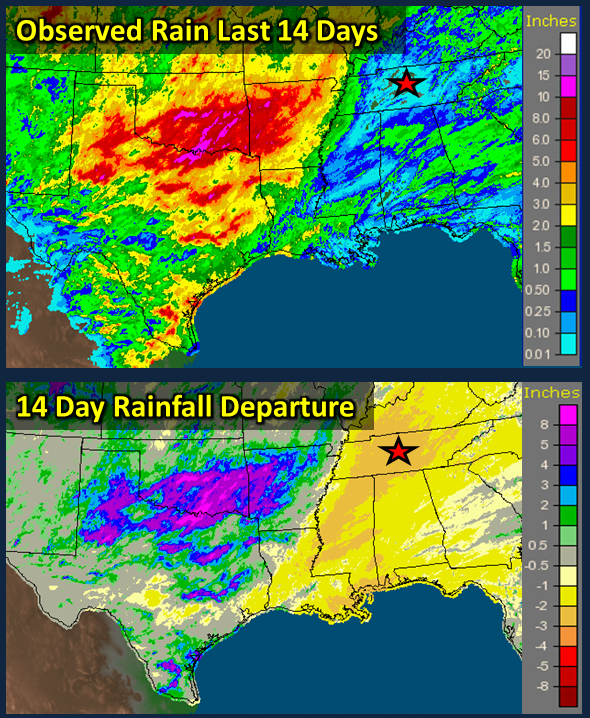 The image above (from NWSNashville) shows how much rain we have/haven’t received in the last fourteen days and where all of it has been. We are about two inches less than what we normally would have this time of year (departure). Other than Monday, we haven’t really had much rain this month (and even some of us weren’t lucky enough to see rain on Monday), but that is about to change. Starting tomorrow, rain chances will be in the forecast every day till at least this time next week. Thursday we will have a 20% chance of rain and thunderstorms with our high reaching about 82 degrees. 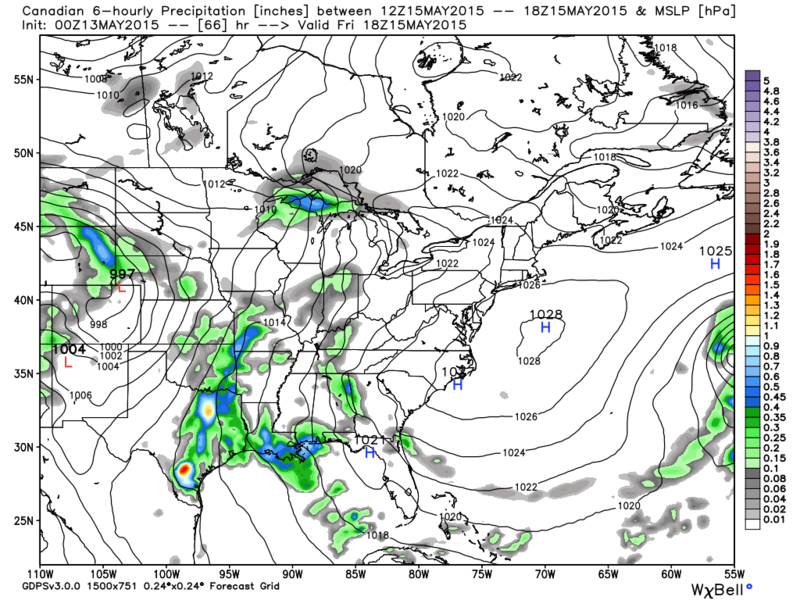 The NAM4 simulated radar wants to say we will get some rain at about 5pm tomorrow afternoon. The timing could be off a bit, so if we do get any rain it is likely to happen around 3pm to 7pm tomorrow. Thursday’s overnight low will fall to about 65 degrees as we keep a 20% chance of rain. The best chance of rain comes Friday and Saturday this week. Both Friday and Saturday we have a 50% chance of seeing rain or thunderstorms. Friday’s high is expected to reach 80 degrees while Saturday’s high will be about 78 degrees. 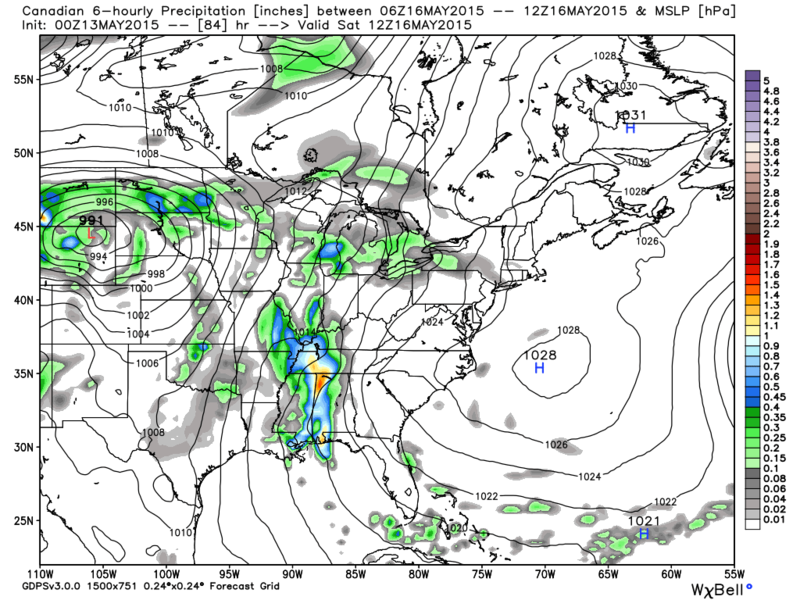 The Canadian model is wanting to show some rain possible over us Friday afternoon. It doesn’t look all that impressive here. Saturday’s rain chances look more impressive, as the Canadian model shows that we will likely get our lawns watered starting early Saturday morning (7am). Sunday rain chances decrease to about 30% as this unsettled rain pattern hangs around a bit. The start of the work week is gonna be wet. Unfortunately it looks like Monday and Tuesday will be wet as well going into the work week. Monday’s rain chance is 50%. It’s still a bit away so I won’t give too much detail. Just be prepared for rain.